A family yesterday paid tribute to a teenager with a “huge heart” and “loveable” personality who died after being hit by a car. Mark Smith, from Torphins, was fatally injured just outside the Craigievar Community Hall, at Muir of Fowlis, just outside Alford on Saturday night. The 18-year-old was attending a birthday party when he was struck by a red Volkswagen Polo at about 10.30pm. 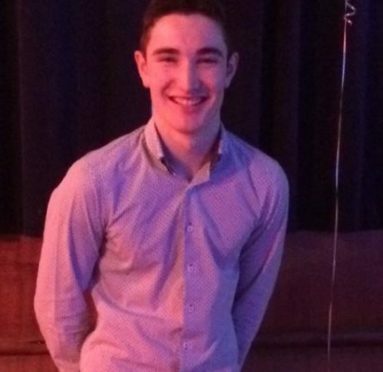 Police and the ambulance service were called but the former Aboyne Academy pupil died at the scene. Friends left the venue in tears as news of the tragedy spread. Yesterday, Mr Smith’s family released a statement where they thanked people for their support in the days since the tragic incident. It said: “Mark was a much loved son, brother, grandson, nephew, cousin, boyfriend and pal to so many. “He had a huge heart, he was cheeky, funny and so loveable which made Mark great to be around. The incident has sent shockwaves around the tight-knit Deeside community and tributes have flooded in for the teen, who was a member of the Mid Deeside Young Farmers Association. The organisation, which is open to people aged between 14 and 30, said he would “sorely missed” by everyone who knew him. “He was a real asset to have as part of our club and an even better friend. He will be sorely missed by us all,” a spokesman for the group said on Sunday. Following the crash, officers subsequently shut the A980 Alford to Banchory road for almost eight hours while collision investigators examined the scene. Police previously appealed for any witnesses who had not yet come forward to contact them. Officers also urged people with mobile phone or dash cam footage of the crash to come forward. Anyone with information should contact police on 101, or Crimestoppers on 0800 555111.